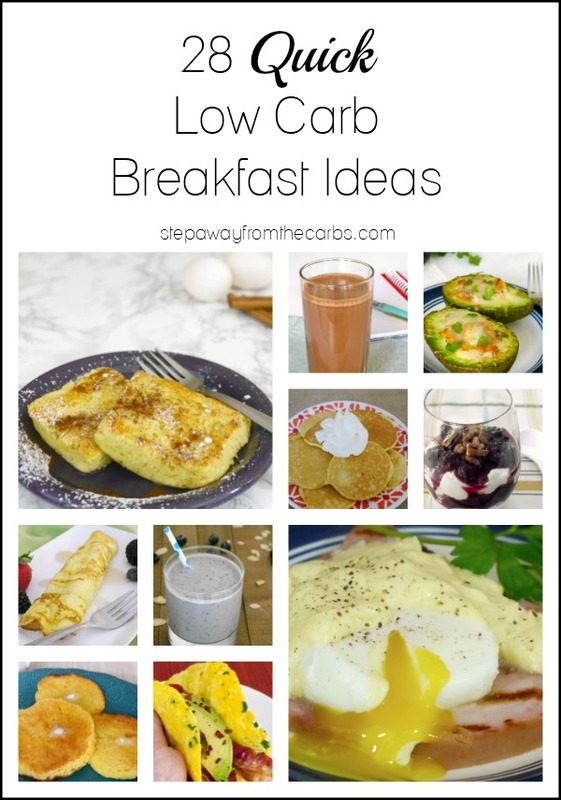 These 28 keto and low carb breakfast ideas can all be prepared within 10 minutes! I’ve been low carbing for over ten years. And I can tell you, there are TWO hard things about this way of eating. Breakfast, and fast food. Really, that’s it! And it’s not to say that fast food isn’t negotiable – it’s just that you always need to change up the original dish, which this British girl shies away from! Breakfast or brunch at home, at the weekend, with all the time in the world, is no problem. But that’s not reality for most people – especially during the week! 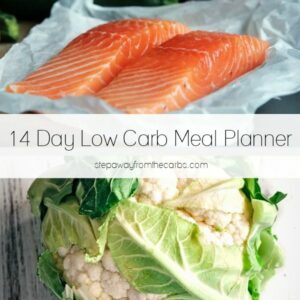 So I figured I wouldn’t be the only one to benefit from this list of low carb breakfast recipes and products that are seriously quick to make. Bacon – I always try and keep cooked bacon available at all times! Not only for breakfast, but also for salads and snacking! Hard Boiled Eggs – I cook around 6 at a time, and then that keeps me going for several days. Perfect for breakfasts where I don’t want to cook. Check out how to cook Hard Boiled Eggs in the Instant Pot! Chia Seeds – Chia need soaking time so that they can absorb liquid. Whether it’s for a drink, dessert, or breakfast – I can sometimes be organized enough to prepare this the night before. 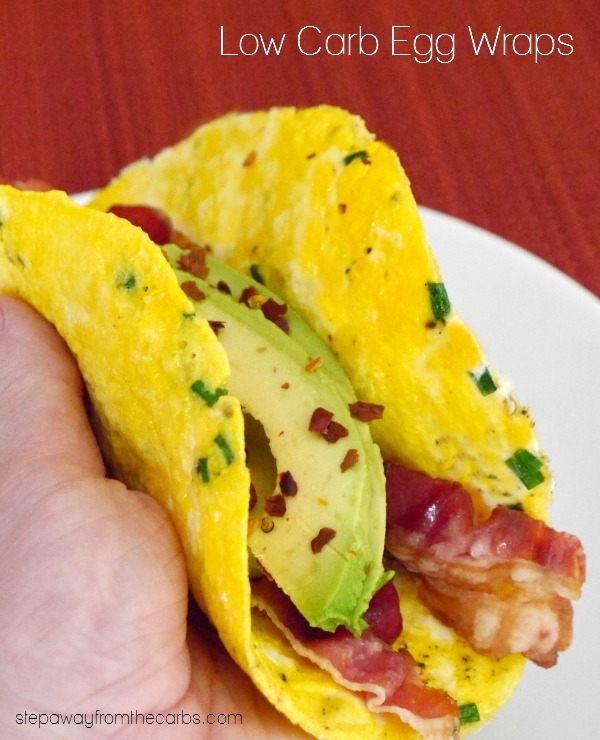 Egg Wraps – fill them with whatever you want – but avocado and cooked bacon is my favorite! Fluffy Pancakes – whizz up the batter in a mini blender and you’ll be enjoying breakfast within minutes! Ham and cream cheese roll-ups – spread the cream cheese over the ham, roll, and go! Faux Danish – this takes a few minutes to prepare, but it’s cooked super quickly in the microwave! Hard Boiled Eggs and Avocado Mayo – mash everything together and enjoy on its own or in a low carb tortilla. Quick Bread – 90 seconds is all it takes to cook this bread, and it tastes great toasted! Almond and Blueberry Shake – super speedy prep for this breakfast shake! 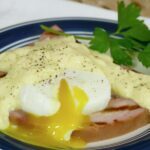 Low Carb Eggs Benedict – grilled ham steak, poached egg, and jarred Hollandaise sauce. This is a cheat’s Benedict but it CAN be made within 10 minutes! Scroll down for a printable recipe card. Update: I’ve now written a tutorial about how to poach eggs in the Instant Pot! It only takes 5 minutes plus hands-off IP warming time! Berry Parfait – use leftover homemade berry sauce to make this tasty breakfast parfait! Or use this fantastic low carb GRANOLA to make a wonderful parfait! Omelets – a classic breakfast dish! 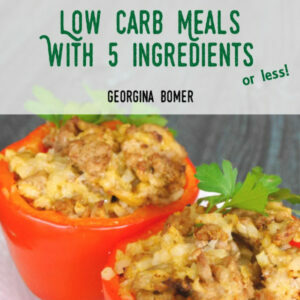 Try adding fantastic low carb ingredients like cheese, ham, bacon, broccoli florets, bell peppers, sausage, and more! 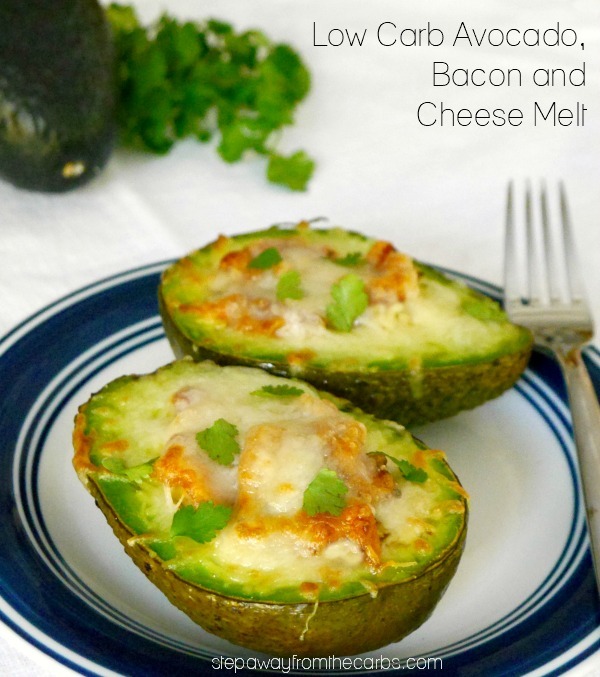 Avocado, Bacon and Cheese Melt – remember I mentioned having cooked bacon handy? It’s perfect for this recipe! Chocolate Breakfast Shake – of course you can have chocolate for breakfast!!! 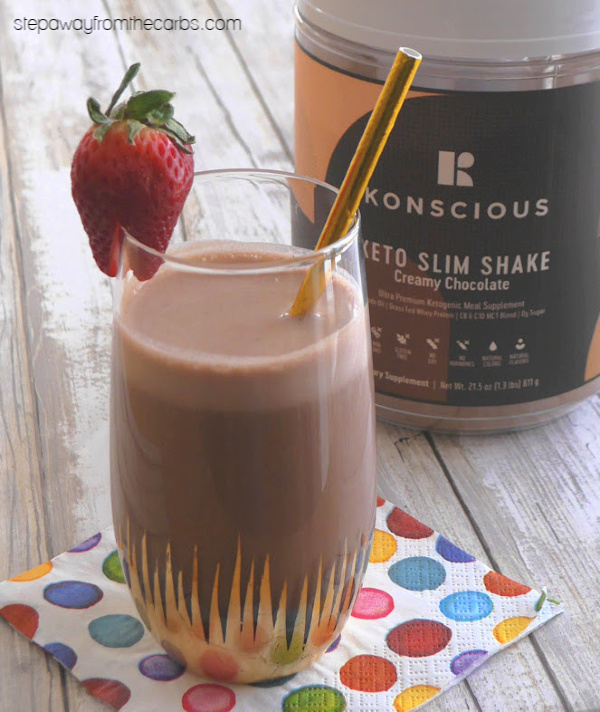 OR – try this chocolate shake mix from Konscious Keto – with added MCTs! Plus there’s a 10% discount! Use “GEO10” when you check out on the Konscious Keto website! Whipped Cottage Cheese with Berries and Nuts – whiz up the cottage cheese in a food processor and add your toppings! 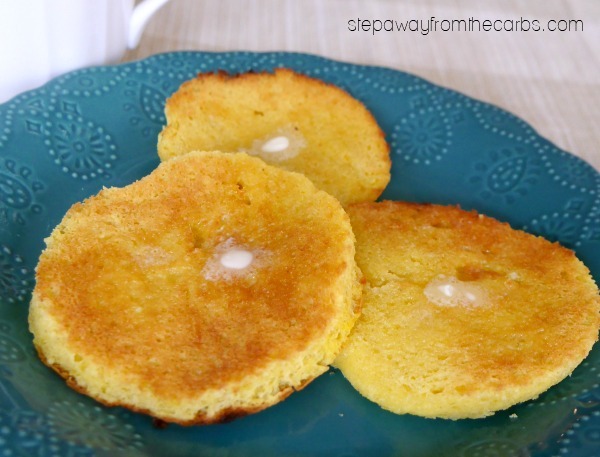 Almond Pancakes – try these mini pancakes with low carb maple syrup! Butter Coffee – I’m not a coffee fan but I know that many of you are! Try this delicious recipe from All Natural Ideas. Avocado and Bacon – mash an avocado, chop some cooked bacon, and mix it together with some hot sauce. Quick Egg and Ham Breakfast – OK, so it’s not the prettiest dish, but this microwave breakfast can be yours in just 3 minutes! 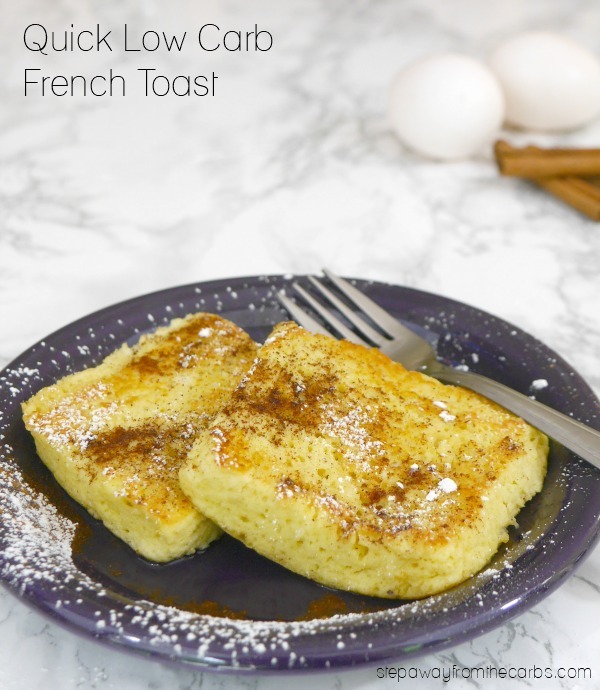 Low Carb French Toast – a single serve portion with all your favorite flavors! Smoked Salmon and Scrambled Eggs – a favorite brunch at our house! 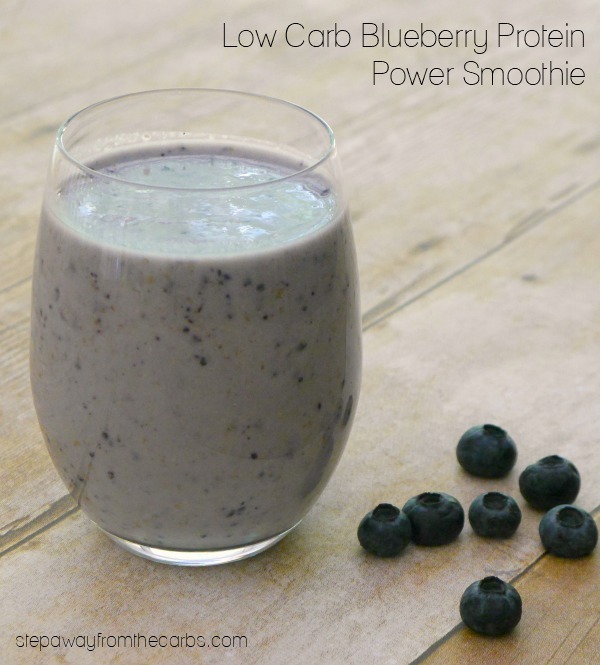 Blueberry Protein Power Smoothie – you can also make this with raspberries! Chocolate Chia Pudding – OK so this is entirely made the night before – but I just had to include it for those of you who are organized!!! Low Carb Crepes – I’ve served these with chocolate hazelnut spread and whipped cream, but you could fill them with whatever you like! And if you’re looking for low carb sandwich bread for a simple toast breakfast, check out my guide to buying low carb bread online! 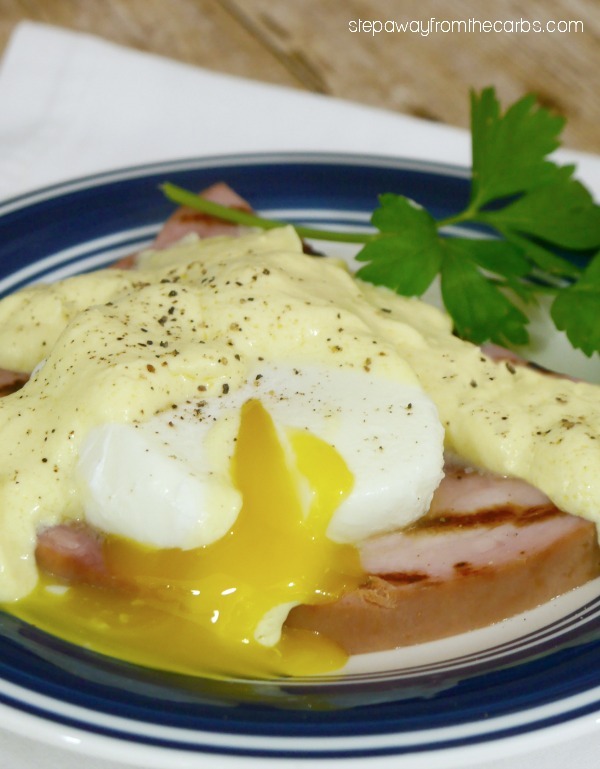 Grilled ham steak, a poached egg, and jarred Hollandaise sauce makes for a quick and tasty low carb breakfast! Crack the egg into a ramekin and set aside. Add an inch of water to a small saucepan, add the vinegar, and season generously with salt. Bring the water to a fast simmer, and use a spoon handle to swirl the water round in one direction. When the water is swirling, drop the egg into the center of the swirl. Turn off the heat, cover, and leave undisturbed for 5 minutes. While the egg is cooking, warm through the ham steak on a grill pan - about 2 minutes on each side. Transfer the ham to a plate, then use a slotted spoon to remove the cooked egg from the water. Pour over some of the Hollandaise sauce, season with black pepper, and enjoy! 3g net carbs per serving (whole recipe).